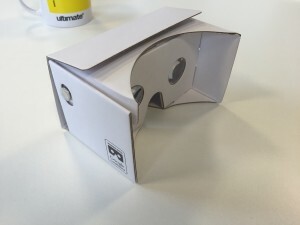 Our very own Google Cardboard VR Headset. Hours of fun from just a piece of cardboard! 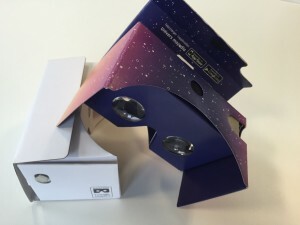 Google has led the way in accessible virtual reality through its Google Cardboard VR headset. And now, it has launched Tilt Brush, a virtual reality painting app that gives any HTC Vive user the tools they need to paint virtual 3D creations. 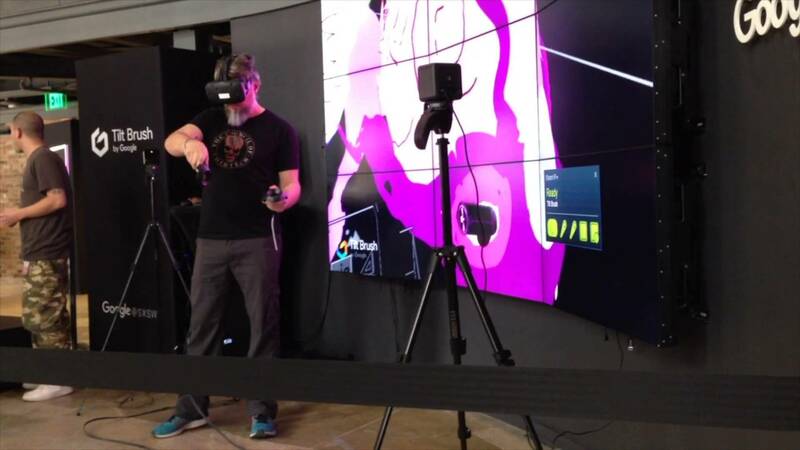 Virtual reality apps are evolving in the same way as mobile apps. They exist in closed gardens, which means that users have to have the right hardware to access the apps they need. The HTC Vive is one of a clutch of VR headsets that runs the Steam gaming platform, which is where you’ll find the new Tilt Brush app. Unlike some rival hardware, the HTC Vive comes with two Vive controllers that look a little like wireless joysticks. Tilt Brush takes data from the controllers, which can be rotated and moved in 3D space, and translates those movements to the paintbrush tools within the app. Once the user has downloaded Tilt Brush, they use the controllers to paint or doodle. And once they have started a 3D creation, they can walk around it as though it were a real physical object. The HTC Vive headset is responsible for sensing the user’s position, and translating that into coordinates that the app can understand. Users can create paintings the size of a room, and walk through them – or around them - to examine them from any angle. If you’ve tried a modern virtual reality headset, you’ll have been wowed by the sense of perspective and depth. And Tilt Brush looks like great fun. Most people will be excited about the idea of being able to draw in virtual space. But can we actually use this technology for anything? Achieving a practical task on a VR headset can seem like something of a challenge. For one thing, most of the apps are currently aimed at showcasing what virtual reality can do, and fall squarely into the entertainment or gaming categories. Tilt Brush wants to change that. It offers a potentially useful way to create paintings, structures, product prototypes and designs without the waste, time or materials required to build something in the physical world. So how would this be used? Fashion designers could design clothes virtually; customers could decorate their homes in a DIY store, before buying wallpaper. Tilt Brush has already been dubbed the Microsoft Paint of its time, giving a respectful nod to the basic paint program that kicked off a graphic design revolution. It packages 3D design and HD graphics with a toolset that closely resembles ordinary 2D editing tools. Once you start to consider the freedom of being able to design something in three dimensions, and the potential cost savings of modelling something virtually, you start to realise how close we really are to a genuine virtual reality evolution.